Many years ago, a young fairy fell in love with a poor fisherman. One day, she stole three peaches from Heaven for her lover so that he could have eternal life when he ate them, and they could be together forever. However, her father, the Jade Emperor, discovered the robbery and turned the peaches into three stone islands and compelled the young fairy to return home. The Three Peaches (Ba Trai Dao) islets are to be found in Lan Ha Bay in the Cat Ba Archipelago. It is a truly pristine region with several small beaches and only a few cruise boats can reach this lost paradise. You can go swimming, kayaking or sunbathing on the beautiful beach or just do your own thing to unwind and relax, especially in the afternoon when there are few people around. Some months of the year, the tides are rather high, and it is only possible to swim from the beach for around 2-3 hours each day as the rest of the time the tide has engulfed it. The Three Peaches islets are just off Cat Ba Island, not far from both Viet Hai village and Cai Beo floating village in Lan Ha Bay. A visit to this exquisite beach area is included in our cruise program en route between Halong and Cat Ba Island, frontier territory of Quang Ninh and Haiphong. The island consists of three small hills, just 23m in height, and seen from afar they resemble three peaches. Around 22km from both Got Harbor and Cai Beo Seaport, it takes an hour to get there by Heritage Cruises or Heritage Express. 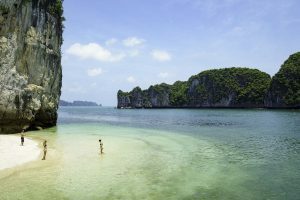 This place has become a destination on the bucket list of beaches to visit for many holidaymakers to the Halong Bay region because of its charming landscape and its connections to the romantic legend of the fairy and the poor fisherman. Lan Ha Bay, in the Cat Ba Archipelago, is covered by nearly 400 limestone mountains and has for centuries been a safe shelter for fishing boats when ferocious storms occur. There are approximately 300 households living in permanent floating villages in the bay and you have the chance to explore the intriguing life in these villages. Cai Beo fishing village in Lan Ha Bay (commonly known as Lan Ha fishing village) is probably the largest and most famous floating village in Asia, where most people live largely by fishing and fish farming. Cai Beo fishing village is only about 2km from Cat Ba town and just 10 minutes from Beo seaport. If you join our Heritage Expedition four-day program, you initially travel by van and then take a small boat or our speedboat or tender to visit the village. Years ago, Lan Ha Bay had about 5,000 households farming Otter Snout clams in floating ponds using plastic baskets, but a disease wiped out the entire population and the fishermen lost their means of earning money and went bankrupt. The farmers discarded all the baskets used to raise the clams and these sank to the bottom of Lan Ha Bay. Red algae started to grow on the baskets, polluting the water and creating a major problem for the fish living in the waters. Many fishermen drag their nets across the sea bottom when fishing and some nets are torn by the discarded baskets, so the fishermen continually have to repair their nets. Now these baskets have been retrieved to help clean the water. Although a fisherman’s life is hard and simple, they appear quite content with their lot in life. They have to start very early and finish very late doing lots of physical work. Fishermen live away from the mainland, but they can buy anything from the hawkers who sell supplies to the villagers from their boats. The fishermen do not have a huge variety of food available to them, like on the mainland, but they can catch fish to feed their families and they just need to buy vegetables, salt and fish sauce. The scenery here is very beautiful with colorful floating houses nestled in the shelter of the islands, a stone backyard. The fishing village of Beo is spread across 18.000m2. The people who live in the Cai Beo settlement evolved from the Neolithic period and were hunter gatherers right through to the Bronze Age when their civilization evolved to become fishermen and also settled on the land to create agricultural settlements. 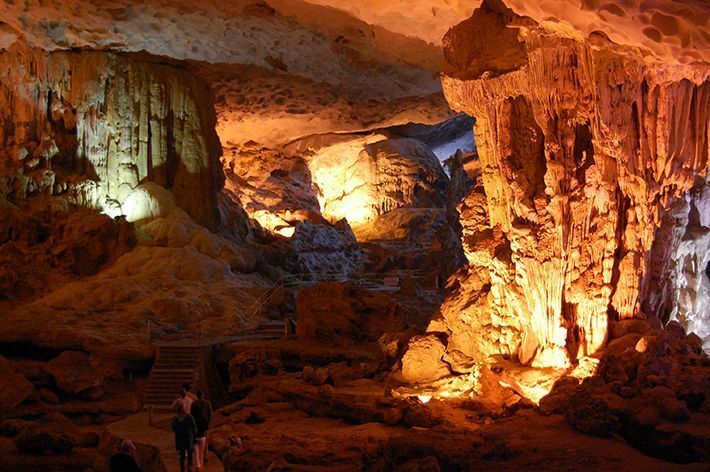 The first indigenous people in Cai Beo are probably descendants of an ancient civilization from Hoa Binh – Bac Son, from around 12,000 years ago. In early 2007, a team of specialist scientists undertook extensive excavations and 10 tombs were revealed with 137 stone artifacts and 1,424 pottery shards, all made from granite, ceramic, and twisted rope as well as fish bones, shells and oysters. Analysis indicated that Cai Beo is a site of archaeological importance and was the home of fishermen around 7,000 years ago, who lived mainly from fishing, scallops and oysters, a way of life that continued until around 4,500 years ago. Guests taking part at Heritage Expeditions (4 days and 3 nights) will have the chance of visiting this unique historical site, and experience this community’s eccentric lifestyle. If Phu Quoc fish sauce is considered to be the most well-known specialty of Phu Quoc Island (Kien Giang province), then Cat Hai fish sauce is one of the most famous products of Cat Hai Island (Haiphong). It has also been selected as one of Vietnam’s top condiments by the Vietnam Guinness Book of Records. Fish sauce first appeared in Cat Hai in the 20th century and was originally called Van Van fish sauce. As soon as you set foot on the island, the first thing you will notice is the salty and fragrant smell of fish sauce being produced right across the island. In the past, people in the north knew Cat Hai fish sauce under the Van Van brand, famous across Indochina because of its quality and rare flavour, with a protein content of around 15-40% per litre. In 1959, it was renamed Cat Hai fish sauce. For locals, Cat Hai fish sauce is indispensable for the family meal and there is simply no substitute. The characteristic aroma of Cat Hai fish sauce stems from anchovy and squid, or Nham fish, combined with sea salt. Each year, more than 7 million litres of Cat Hai fish sauce are supplied to the market with over 700 agents and outlets throughout 24 provinces across Vietnam. But it is not only for domestic consumption; Cat Hai fish sauce is also exported to many countries in Asia and to Eastern Europe. The method of production determines the quality of fish sauce and is still mainly manual. Fish sauce here is made from Ca Com (anchovies) and Nham, a species with a special taste, from the waters surrounding Cat Hai. The fish must be fresh and anything else will ruin the natural flavour of the final product. The fish is cleaned before being mixed with salt and the mixture, called chướp, is then placed into containers like wooden barrels or concrete tanks. The top layer is pressed down with a bamboo net containing heavy stones. It is very important that “chướp” must be exposed to sunlight and has to be stirred constantly. “Chướp” is brewed and sun-dried for between 12 and 24 months during the self-ripening process. After that, the fish have naturally reacted with the water and are totally hydrolyzed, yielding the salty, fishy liquid that has a very high protein content and a light amber color. No chemicals are used to create the smell or color. When visiting Cat Hai, visitors should ensure they take the opportunity to observe the process of making fish sauce and enjoy its delicious taste. Authenticity is the buzzword for Cat Ba Archipelago and Lan Ha Bay. Traveling to Cat Ba by road only takes 1.5 hours from Hanoi by the 5B Highway. 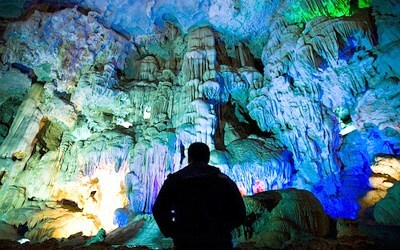 Nowadays, travelers are switching from Halong Bay to Cat Ba and Lan Ha Bay in increasing numbers. This place is now firmly in the development phase; everything is just getting started. Lan Ha is so small that you can rent a cruise boat to explore the bay by yourself. This is perfect for Cat Ba’s based travelers who are self-confident and experienced and want a whole new kind of adventure. Cat Ba is the largest of the 366 islands spanning the 260km2 that comprise the Cat Ba Archipelago, which makes up the southeastern edge of Halong Bay in Northern Vietnam. Cat Ba island has a surface area of 285km2 and retains the dramatic and rugged features of Halong Bay. This island belongs to Haiphong City – an important industrial city which, together with Hanoi and Halong, forms an important economic triangle in North Vietnam. Approximately half of Cat Ba Island is covered by a national park, which is home to the highly endangered Cat Ba Langur. The island has a wide variety of natural ecosystems, both marine and terrestrial, leading to incredibly high rates of biodiversity. 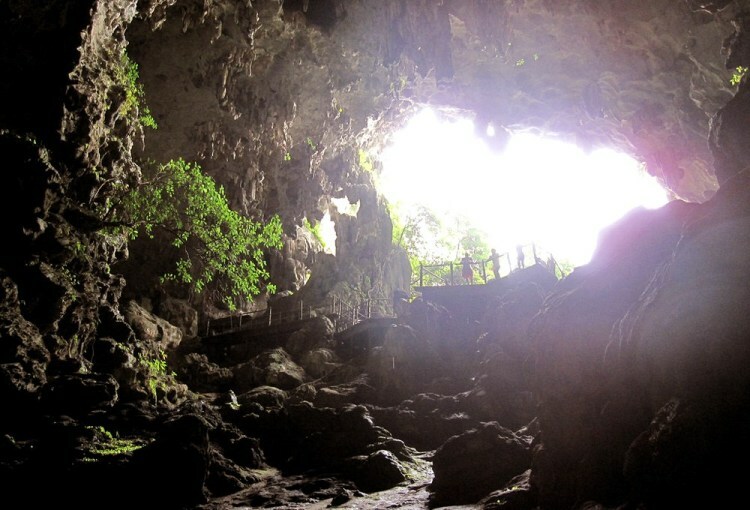 The types of natural habitats to be found in the Cat Ba Archipelago include limestone karsts, tropical limestone forests, coral reefs, mangrove and sea-grass beds, lagoons, beaches, caves, and willow swamp forests. Cat Ba island is one of the only populated islands in Halong Bay, with roughly 13,000 inhabitants living in six different communes, and 4,000 more inhabitants living on floating fishing villages off the coast. The majority of the population can be found in Cat Ba town, which is located at the southern tip of the island (15km south of the national park) and is the commercial center. Cat Ba’s fish sauce is particularly famous and one of the main industries on the island and travelers can visit the factory in Cat Ba town. Halong Bay is understandably popular and crowded, but if you want to experience it without other tourists, be sure to book our private charter boat that will sail where you want, cruising on your own itinerary. Go deep into the bay, explore the caves and grottoes, head over to Bai Tu Long Bay and Lan Ha Bay, trek in Cat Ba National Park, go rock climbing, kayaking, and watching some of the most amazing sunsets that you’ll ever set eyes on. Heritage Cruises can help you to take up his challenge with three experiences: Dream Cruise for one day, Discover Cruise for two days, Explorer Cruise for three days and Expedition Cruise for four days. In addition, we arrange private charters for four or five day expeditions in the Gulf of Tonkin.